Constructing Measures introduces a way to understand the advantages and disadvantages of measurement instruments, how to use such instruments, and how to apply these methods to develop new instruments or adapt old ones. The book is organized around the steps taken while constructing an instrument. It opens with a summary of the constructive steps involved. Each step is then expanded on in the next four chapters. These chapters develop the "building blocks" that make up an instrument--the construct map, the design plan for the items, the outcome space, and the statistical measurement model. The next three chapters focus on quality control. They rely heavily on the calibrated construct map and review how to check if scores are operating consistently and how to evaluate the reliability and validity evidence. The book introduces a variety of item formats, including multiple-choice, open-ended, and performance items; projects; portfolios; Likert and Guttman items; behavioral observations; and interview protocols. Each chapter includes an overview of the key concepts, related resources for further investigation and exercises and activities. Some chapters feature appendices that describe parts of the instrument development process in more detail, numerical manipulations used in the text, and/or data results. A variety of examples from the behavioral and social sciences and education including achievement and performance testing; attitude measures; health measures, and general sociological scales, demonstrate the application of the material. An accompanying CD features control files, output, and a data set to allow readers to compute the text's exercises and create new analyses and case archives based on the book's examples so the reader can work through the entire development of an instrument. 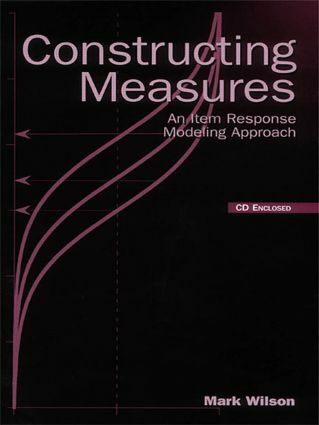 Constructing Measures is an ideal text or supplement in courses on item, test, or instrument development, measurement, item response theory, or rasch analysis taught in a variety of departments including education and psychology. The book also appeals to those who develop instruments, including industrial/organizational, educational, and school psychologists, health outcomes researchers, program evaluators, and sociological measurers. Knowledge of basic descriptive statistics and elementary regression is recommended.